We start this list with luminous colours. The best type of colours it could be argued if you are aiming to create a long lasting shirt design. What is great about this shirt is the fact that all of the text and logos are in the green colouring so as not to detract from the desired effect. I feel with this particular design and style that the green section colour actually have been any colour really as anything looks smart against a black and grey backdrop. The circles that run down the shoulder of all Jako shirts give off a futuristic look in this green which I can only imagine that it will look even sleeker when the player is running down the wing, wearing this shirt. The only thing you need to remember if you are looking to buy this from a UK point of view is that as with all Jako shirts their sizes are based on a "European" size. So if you are wanting a medium then you would need to buy a large in order to get the UK medium. Hannover 96 fans in my opinion have been blessed with three amazing shirts for this season. I could so easily have chosen either the home or the third shirt as all of them standout as great examples of football shirts. 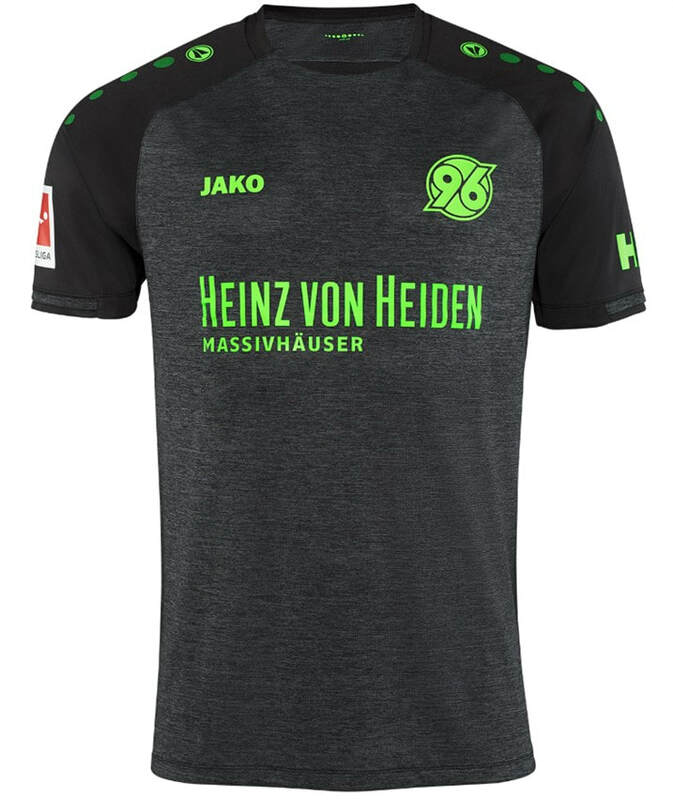 I am looking to purchase this shirt to update the current Hannover shirt that I own. It is somewhat weird seeing an Eintracht Frankfurt home shirt in a colour other than red. However I can quickly overlook this based on the amazing design of this football shirt. Maybe it is the trickery and manipulation of modern image editing but this shirt looks wonderfully sleek and shiny. The way that the shirt has been designed with the thicker and narrower vertical lines, allows this shirt to look like the perfect example of the modern football jersey. I think you will start to notice a theme during this list with regards to the colour schemes that have been selected. The Bundesliga certainly has gone for a more contemporary look this season. 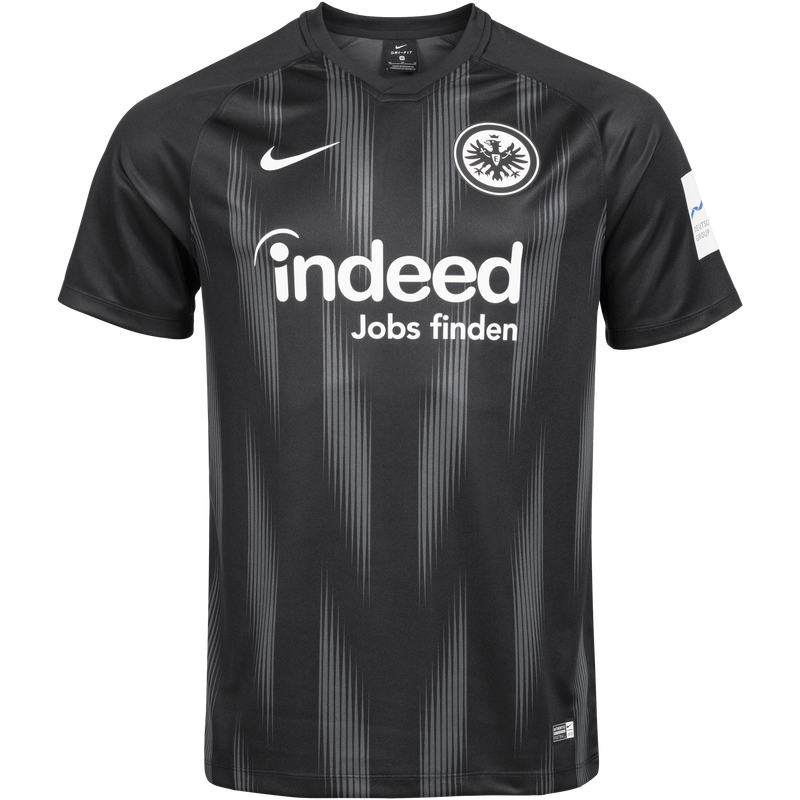 I like that the sponsor and both logos are white as this both makes the shirt look even more complete but also links to the white that can be found on some of the previous home shirts that Eintracht Frankfurt have released. I feel the away shirt for this season is a nice compliment to the home one as the colours are flipped the other way. The third shirt though isn't one that particularly stands out for me. The word that immediately jumps out when looking and thinking about this shirt is "Stealth". This is one hell of a stealthy shirt. In fact it is possible that you didn't notice the camouflage pattern that has been subtly sewn into the fabric. I am a big fan of shirts that incorporate a camouflage design, especially one that looks as cool as this one. it is possible that if you were walking past this shirt in the street that you might not even realise that this is a replica football shirt and that it is just a standard T-Shirt promoting the Red Bull brand, which I guess is the point of this club as a whole...As with the two previous shirts I appreciate the fact that the logos and sponsors are all the same colour and compliment the overall look of the shirt. Compared to the other two shirts released for the club this season, it really does stand out in contrast. The other two shirts are covered in the traditional colours that you would expect from Red Bull whereas this one strays away from those associations. I love seeing orange on a football shirt. It doesn't matter if its only a small feature on the shirt. I feel like this shirt is the best example of a darker shirt of all the four mentioned so far. This shirt in my opinion is easily identifiable as a football shirt whereas the shirts before could either be mistake for a training shirt or just a sports shirt in general. Umbro have really shone this season which is proven by its presence in the top 5 list that I did for the Premier League. The base colour and design of this shirt is very similar to the Hannover 96 shirt above which I feel is one of the best canvases to work on when designing a football shirt. You cant really go wrong with the rest of the shirt once you have that. The orange trims help bring life to the shirt. All of the shirts that 1. 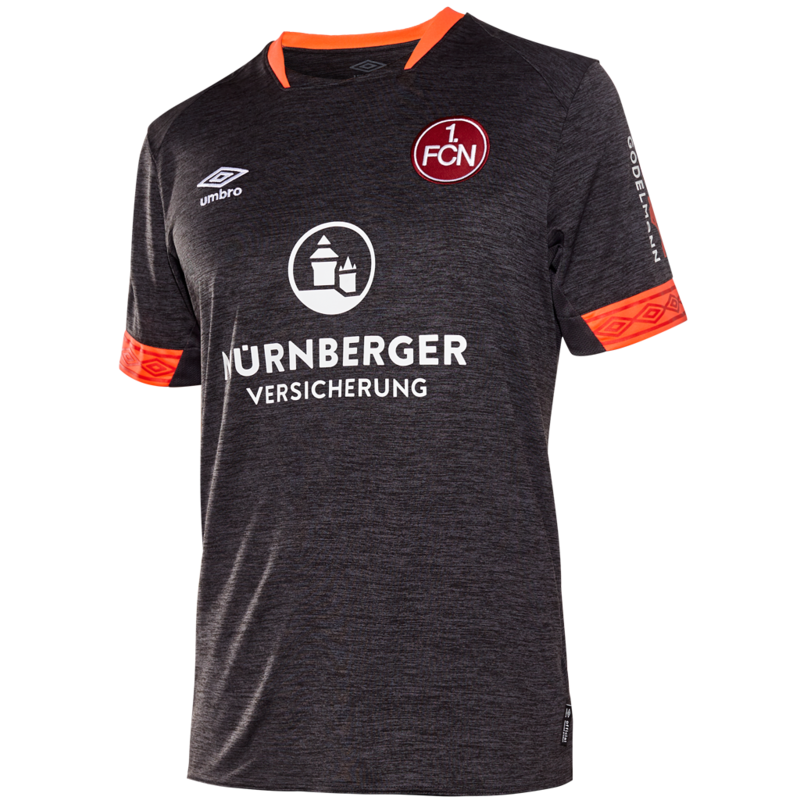 FC Nürnberg have released this season have been designed amazingly well. If I was a supporter of this team I certainly wouldn't find it difficult buying all three shirts for this season. I personally might keep my eyes open for this shirt if I can pick it up in the sales at some point. You may have noticed a style switch with this shirt in comparison to the previous four shirts. Whereas the previous four shirts have all been about being cool and understated, this shirt certainly isn't one of those things. This shirt stands out a mile away which is one of the attributes I look for when it comes to collecting a shirt. This is the sort of shirt that in five years will be worth a pretty penny if it is kept in mint condition. The design follows a standard horizontal stripe but it has a different take by utilising a gradient effect across some of the stripes. The outrageous colour scheme though is the main selling point of this shirt though. Blue is one of my favourite colours for a shirt so when I saw this shirt I instantly became a fan. This shirt along with the home shirt is a great pairing and I must admit that I am jealous that Nike didn't use one of these two designs for a Chelsea shirt this season. 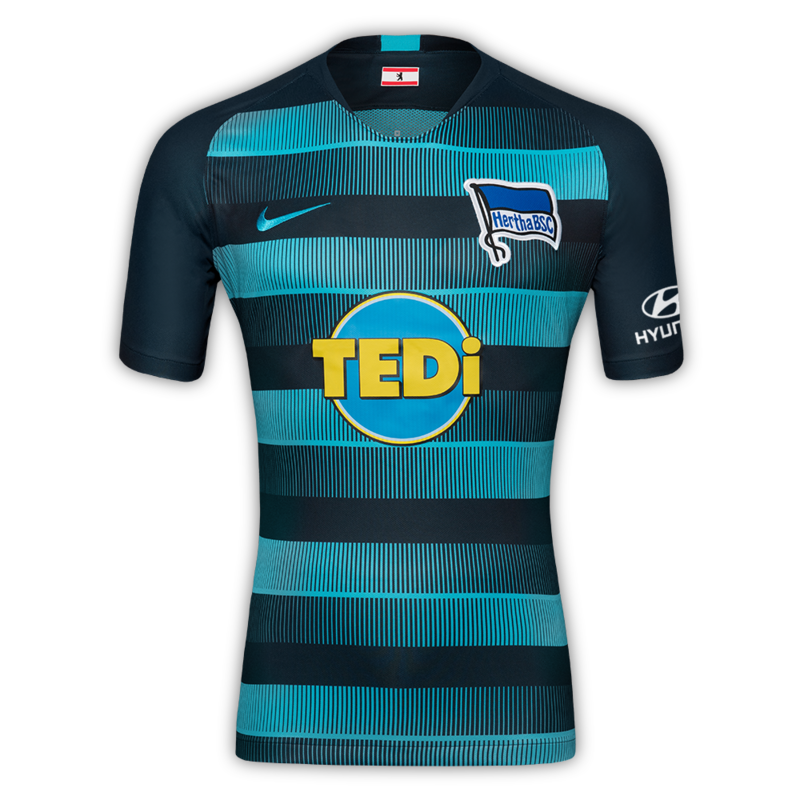 I will absolutely be looking out to pick up this shirt in the sales as the current Hertha Berlin shirt that I own isn't exactly awe inspiring, especially in comparison to this shirt.